With its lush rainforest, golden sand beach and crystal clear waters, it’s not hard to see why Broken Head’s positive reviews are justified. 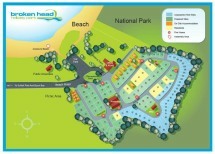 Even though the bustling community of Byron Bay is just ten minutes north of here, the unspoiled nature of this coastal area makes Broken Head Holiday Park one of the most sought after Byron Bay campsites to stay in. The Broken Head Nature Reserve is jointly managed by the National Parks & Wildlife Service (NPWS) and the Arakwal People. The area is protected from development so its beauty can be enjoyed by generations to come. Indeed, the scenic charms of Broken Head have even been featured on the big screen. In 2012 it was the location for the movie Return to Nim’s Island. One of the enduring Aboriginal stories of the area is that of the Three Sisters rocks off the coastline. It is also the name of the walking track which starts near the picnic area and meanders through the rainforest and emerges onto a headland lookout. From here a rocky coastal panorama spreads out before you and in winter and spring you may spot migrating whales. Visitors staying in Byron Bay campsites should take care to remember sunscreen, hat and bottled water when undertaking the walk. It takes 45 minutes each way and is rated ‘medium difficulty’. Despite its compact size visitors exploring the Broken Head Nature Reserve from Byron Bay campsites might be surprised to know there are 240 plant species located here, some of which are endangered species. Whether you’re a nature lover or just after some well-earned R&R in a pristine holiday spot, contact us to find out more about our family friendly holiday park or Byron Bay campsites near Broken Head.